Ospreys fly-half Dan Biggar says it would be unacceptable if no Welsh region reached the Pro12 play-offs. The top four teams in the table play off for the title in May, with Ospreys - the highest-placed Welsh region - currently fifth. Ospreys, who trail fourth-placed Glasgow by four points, face leaders Leinster in Swansea on Friday. "It wouldn't be good enough if there isn't a Welsh team in the play-offs," said Wales international Biggar, 24. Ospreys won league titles in 2005, 2007, 2010 and 2012, but face a struggle to reach the final stages following last weekend's 11-9 defeat by Glasgow at Scotstoun. Glasgow, who have a game in hand on Ospreys, travel to second-placed Munster on Saturday. "We certainly haven't given up," Biggar said. "Our run-in is reasonably good, though we have a tough one against Leinster on Friday night. "But if we can overcome that hurdle we've got three good fixtures in terms of the Dragons, Connacht and Zebre just to try and pick some points up, so we're certainly not out of it. "But it means we're relying on other teams, and us picking up some bonus points along the way. "It is something that we pride ourselves on - we've got a really good record in this tournament and it would hurt not being involved in those play-off games." 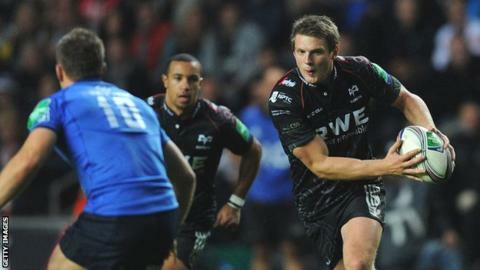 Biggar admitted to BBC Radio Wales that he was frustrated by the Welsh regions' lack of success in Europe this season. Ospreys, Blues and Scarlets failed to qualify for the quarter-finals of the Heineken Cup, while Newport Gwent Dragons were knocked out in the pool stages of the second-tier Amlin Challenge Cup. "Watching the last eight of Europe last weekend was painful because those are the type of games that we used to play in," Biggar said. "At the minute no Welsh team are looking anywhere near close, so something has to be done." But he warned that the regions will find it harder to compete against the better-funded French and English clubs. "It's becoming more and more difficult in terms of the budgets when you compare it to the likes of Toulon or Clermont. "Watching Toulon at the weekend, they were able to have Bryan Habana on the bench for the whole of their match, so that's where we're at. "We have a lot of young players coming through and we have to try and integrate them with the squads. "Everyone's aware of how tough the situation is in Wales, but as a player watching those games on the weekend I was very envious."